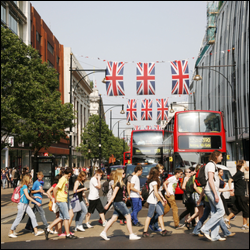 How Much Will the UK Retail Model Change? Another high street casualty could possibly take with it around 6000 jobs as electrical store Comet goes to the wall. It's a sorry sign of the times and reminds us that the UK economy is suffering with a banking system that also remains on life support. Comet's inability to get the appropriate cash running through its stores acts as a sharp reminder that cash-flow is critical to the survival of most businesses. However, in the case of this retailer, it's reluctance to fully embrace the online world also acted as significant drawback. When it comes to electronic retail, there is stiff competition as there is so much choice on the internet, especially from the likes of Amazon. And then of course there are the supermarkets; Tesco is the UK's third largest electrical retailer right now. So whilst the demise of this store may be good for its competitors, who saw their share prices jump significantly on the back of the news, they must not become complacent. They must continue to be wary of the threat posed by those well established online suppliers of televisions and washing machines. Moves are afoot though. Home Retail, the owner of Argos, have recently announced that they are to scale back the catalogues and concentrate on their online offering. Only recently I was in an Argos store and it was interesting to overhear some Australians who had clearly never shopped there before. They seemed to be complaining about the whole set up as they couldn't actually see anything; for them it was sheer confusion. So maybe a refresh of the long-standing model is required and it will be interesting to see just how far they go.